The Allie 43 inch vanity combo brings to you good looks and generous storage. An uncomplicated design scheme gains luster from the sophisticated Twilight Gray finish with brushed silver trim and hardware. A solid birch wood frame, plywood drawer boxes, dovetail joints, a convenient toe kick, and soft-close glides and hinges testify to the quality of construction. The vanity combo includes a white quartz top and rectangular undermount sink. A large open shelf provides ample storage. Inspired by mid-century modern console design, the Coventry Collection from Avanity features solid teak construction with minimal ornamentation. The 49 inch natural teak Coventry features soft-close doors, sturdy and stylish splayed legs, and an abundance of storage space. Teak is the perfect material for bathroom furniture, as it is both durable and water resistant. With Coventry form follows function with superb simplicity. The combo includes a natural Carrera white marble top and undermount rectangular sink. Marrying mid-century modern design details with the durability and water resistance of solid teak construction, the Harper Collection from Avanity will be the highlight of your bathroom space. Splayed tapered legs, louvered doors, soft-close hinges and glides all testify to the aesthetic care we put into designing this collection. Available in multiple sizes and natural teak, Harper provides abundant storage without sacrificing essential beauty. The combo includes a natural Carrera white marble top and undermount rectangular sink. Classical in style, the Thompson 73-inch combo boasts a timeless appeal that will enhance the beauty of any bathroom. Tasteful detailing enriches the sophisticated aesthetic that includes the choice of either a Charcoal Glaze or French White finish. A solid wood frame, dovetail construction and Black Bronze hardware speak to the quality craftsmanship of this collection. The combo includes a durable carrera white marble top and dual oval white vitreous china sinks. 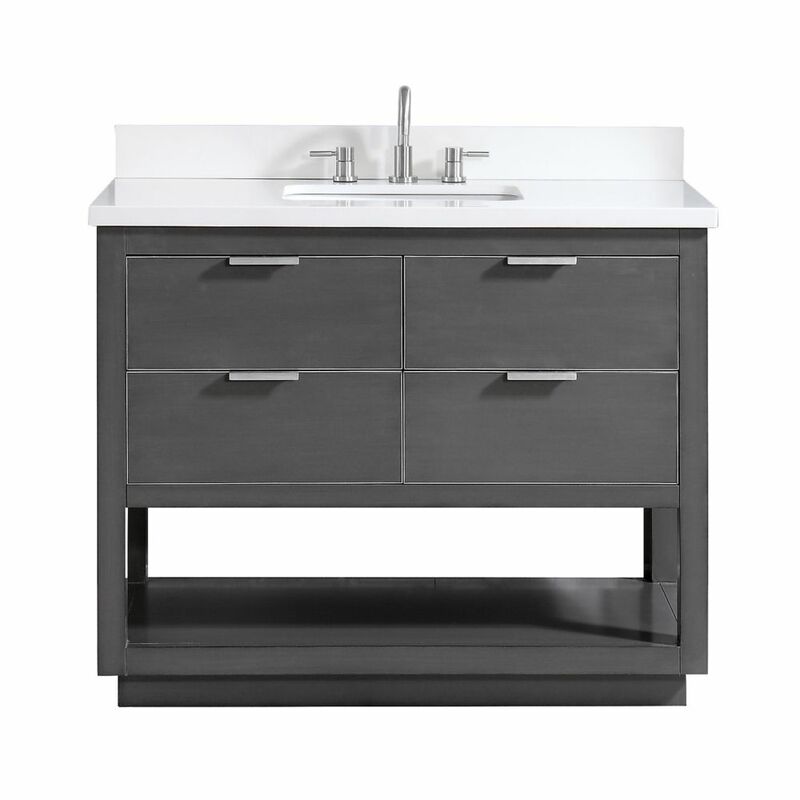 Sophistication is priority with this sleek 42" gray Bosconi vanity set. The ceramic, Rectangular Vessel and vertically mounted mirror accentuate the modernistic approach to the design. Features include one center cabinet with soft closing doors and one detached side cabinet with three drawers. All spacious enough to house your essential bathroom supplies. Allie 43 inch Vanity Combo in Twilight Gray w/ Silver Trim with White Quartz Top The Allie 43 inch vanity combo brings to you good looks and generous storage. An uncomplicated design scheme gains luster from the sophisticated Twilight Gray finish with brushed silver trim and hardware. A solid birch wood frame, plywood drawer boxes, dovetail joints, a convenient toe kick, and soft-close glides and hinges testify to the quality of construction. The vanity combo includes a white quartz top and rectangular undermount sink. A large open shelf provides ample storage.